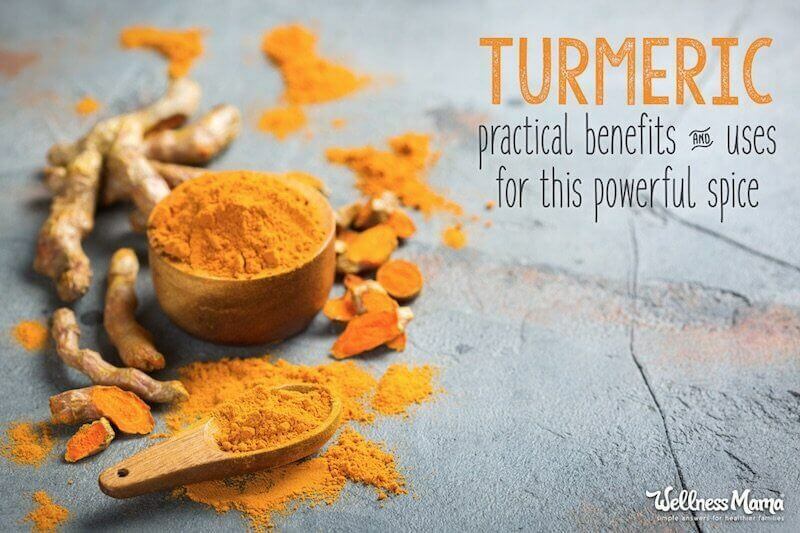 Turmeric is a powerful spice with an impressive list of uses and benefits. It’s known for its antioxidant content and ability to work as an anti-inflammatory. 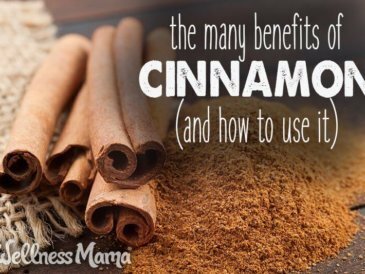 This common culinary spice is prized in many cuisines around the world and with good reason. The spice we refer to as Turmeric is actually the dried and ground rhizome of a plant in the same family as ginger. It is used and prized for its color and earthy flavor in culinary traditions around the world. Modern medicine recognizes its health benefits and it has been used extensively in natural and folk medicine for centuries. The secret of this ancient spice is curcumin, a compound well-studied for its health benefits. Turmeric contains up to 3% curcumin by weight. Curcumin may also improve digestion of fats and sugars and help alleviate inflammation in the digestive system. It is even used in the mouth to help alleviate gum problems! The benefits attributed to this bright yellow spice are often the result of the curcuminoids it contains. The most common curcuminoid is curcumin, which is now available as a supplement and in many remedies. While turmeric has many benefits, it is only about 3% curcumin by weight, and often more concentrated curcumin supplements are used. Are Turmeric and Curcumin the Same? In short, yes and no. Curcumin is the compound contained in turmeric, while the root itself is the bright yellow spice in whole form. In other words, all turmeric contains curcumin but this only makes up about 3% of its weight and it contains many other beneficial compounds as well. 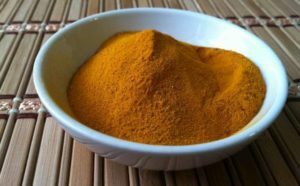 Isolated curcumin is taken from the root and many people often take this as a remedy since it is more potent than turmeric powder. If you’ve researched this ancient spice at all, you may have seen that many supplements and recommendations also include black pepper as well. Black pepper contains piperine, which has been shown to dramatically increase the absorption and effects of turmeric. Personally, when I use this spice for cooking or natural beauty recipes, I make sure to add a little black pepper as well for this reason. Turmeric is generally considered safe for use in medicinal amounts, but it is important to talk to a doctor before using this or any substance medicinally as it can interact with several medications. The name is slightly misleading, but this “tea” is a blend of some kind of milk (including almond milk or coconut milk), spices and optional sweetener. Currently, I enjoy this with homemade pecan milk for a deep, earthy flavor. We drink these often during winter months as a satisfying warm beverage and to help ward off illness. See the full recipe here. 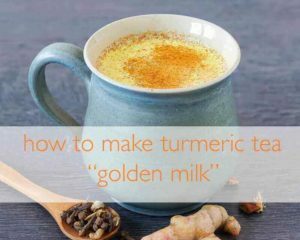 TIP: Using a fat soluble base like milk or pecan milk increases the absorption of the turmeric. The addition of a pinch of black pepper increases the absorption of the turmeric. I also like to add some liquid vanilla stevia instead of other sweeteners for a slight sweetness without the sugar. 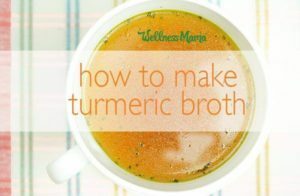 If the Golden Milk drink above isn’t your thing or if you prefer a more savory warm drink, turmeric broth is a great alternative. Instead of a milk or milk alternative, the base of this drink is broth (here’s how to make your own). 1/2 teaspoon each of cumin black pepper and salt. First, place all the ingredient sin a small saucepan. Then, simmer the mixture for about five minutes. Finally, blend with an immersion blender (optional) and enjoy. Any herbs or spices work and can change up the flavor of this recipe. TIP: This is also a great base for soups or stews. To make a 5-minute nutrient-packed egg drop soup, crack four raw eggs into the broth above as it is simmering while whisking rapidly. 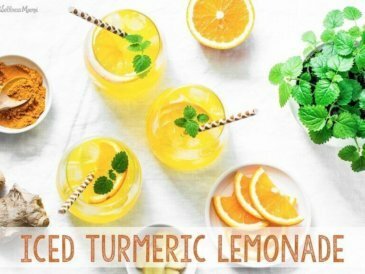 Turmeric can also be used on skin! One of my favorite ways to use it is in a face mask. You can add 1/2 teaspoon of turmeric powder to any face mask recipe you love. This vibrant and earthy spice already has a reputation as a staple in many cuisines and I love cooking with it! 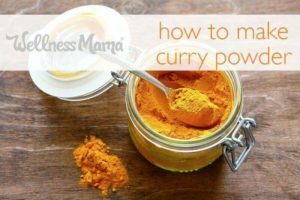 One of my favorite ways to incorporate small amounts of this power spice is by making a homemade curry powder. 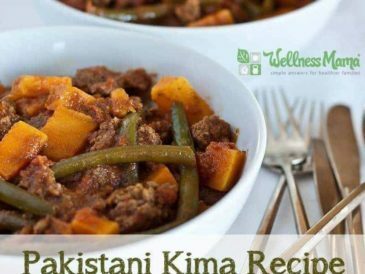 This uses a host of powerful spices and provides awesome flavor to many dishes. Make your own curry powder with this easy recipe. Not all smoothies have to taste like a pina colada. One of my favorite smoothies has a hint of sweet nestled among earthy spices. To Make: Blend 1 cup of pecan/almond/coconut milk with 1/2 cup frozen pineapple, the juice of one lemon and one orange, 1/2 teaspoon turmeric, a tiny pinch of black pepper, and about a teaspoon of grated fresh ginger root. Add a natural sweetener like stevia if desired. Try this spice externally in poultices to sooth skin and reduce inflammation. It is often used in lotions or preparations for skin with eczema or psoriasis for this reason. I’ve personally used this when I’ve twisted an ankle or broken a toe (there is nothing doctors can really do for a toe anyway). What I did: I made a thick paste of castor oil, turmeric and a small amount of black pepper and rubbed over the inflamed area (in this case, my broken toe). I wrapped with a waterproof wrap and a bandage and left on the toe for a few hours. It didn’t help the bone (of course) but seemed to calm some of the inflammation and reduced my pain. This does stain slightly so I wouldn’t recommend it in visible areas (it will fade after a few days). Just like in the face mask above, the anti-inflammatory properties of this unique spice makes it beneficial to help cool and stop acne. I make a paste of honey and turmeric (2 parts honey to 1 part turmeric) and dab on to spot treat. I was skeptical about putting turmeric on my teeth since it has such a propensity to stain. I got over my fears pretty quickly after seeing how well it worked for my friend Heather. Here’s how she used it to whiten teeth. I’ve found that a thin paste of aloe vera gel and turmeric can help calm itchy or burned skin. I’ve used this on bites, poison ivy and even eczema with good results. Fair warning… it is messy! For kids, I let them use this right before bathing while they are in the tub to keep the mess down. It only takes a few minutes to help cut the itch/pain so I read them a book and let them finger paint the turmeric salve on themselves. Sure, we can think of creative ways to use it, but this simple spice is great when added alone to many dishes. I like to add it to eggs, roasted veggies, meats, and soups for a wonderful flavor. 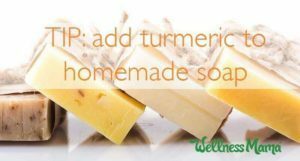 If you make your own soap, add turmeric for color and for skin benefits. If you don’t make your own soap, you should give it a try! It’s a lot easier than you’d think (here’s a super simple cold process recipe). This spice makes a beautiful colored soap that can be especially helpful for soothing irritated skin. Have trouble getting kids to like this potent spice? It is such a great remedy and can help soothe a sore throat, but kids don’t love the taste. My solution? Neon yellow cough syrup (at least that is what my kids call it). 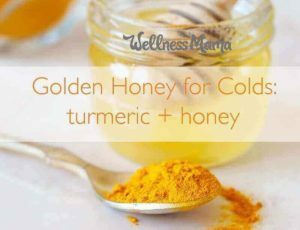 I add 3 tablespoons of powdered turmeric to an 8 ounce mason jar of honey (about 1 cup of honey). By definition, this is actually an electuary, but my kids just think of it as a brightly colored honey that helps their throats feel better. This can be made ahead of time and stored for a very long time since both ingredients are shelf stable. This powerful root has many benefits, but also a few important cautions. As I mentioned, it is very important to talk to a doctor before using it as a remedy for those who have any medical condition or who are pregnant or nursing. Culinary use is generally considered safe. Some folklore info suggests that it was used as a birth control and it should not be taken by women who are pregnant or trying to become pregnant (though using it in cooking is fine). When used externally, it will give the skin a light yellow hue for a little while after use and this can easily be washed off. Sources disagree about using turmeric in hair. Some say that it helps improve hair and stop dandruff, while others swear it is a natural way to remove hair. I haven’t found strong enough evidence for the potential benefits in hair to make me brave enough to try it though. There can be a tremendous difference among different brands of Turmeric. 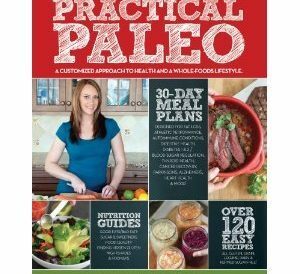 I purchase it in powdered form here as it is a great value and I am extremely impressed with its quality. You may also be able to find high quality Turmeric locally, just look for organic with bright yellow orange color and no added ingredients. 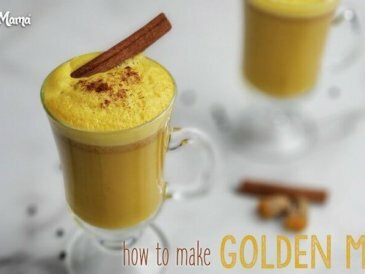 Do you cook with Turmeric? Ever used it for other uses? Please share below!